LOS ANGELES -- The nation's second-largest school district shut down Tuesday after a school board member received an emailed threat that raised fears of another attack like the deadly shooting in nearby San Bernardino. Authorities in New York City said they received the same threat but quickly concluded that it was a hoax. New York Mayor Bill de Blasio told reporters that he was "absolutely convinced" there was no danger to schoolchildren in his city. "There was nothing credible about the threat. It was so outlandish," de Blasio said. Police Commissioner William Bratton quipped that it looked like the sender of the threat watched a lot of the Showtime terrorism drama "Homeland." Los Angeles officials defended the move during a late morning news conference. "It is very easy in hindsight to criticize a decision based on results the decider could never have known," Los Angeles Police Chief Charlie Beck said. The shutdown abruptly closed more than 900 public schools and 187 charter schools attended by 640,000 students across Los Angeles. Superintendent Ramon Cortines said every campus would be searched, and he asked for a report on the searches certifying that all buildings are safe. The threat, de Blasio and Bratton said, came in the form of a "generic" email to many cities around the country. In New York, it was received by a superintendent early Tuesday. Bratton called the closure a "significant overreaction." "We cannot allow ourselves to raise levels of fear," said Bratton, who once ran the Los Angeles Police Department. The person who wrote the note, Bratton said, claimed to be a jihadist but made errors that indicated the writer was really a prankster, including spelling the word "Allah" with a lowercase "a." Lupita Vela, who has a daughter in the third grade and a son who is a high school senior, called the threat "absolutely terrifying" in light of the San Bernardino attack, which killed 14 people earlier this month. She got an automated phone call informing her of the closure. "I know the kids are anxious," she said. District spokeswoman Shannon Haber said the threat was sent by email to a school board member and was believed to have come from an IP address in Frankfurt, Germany. Authorities would not elaborate on the threat, saying it was still being evaluated. They described the shutdown was a precaution. 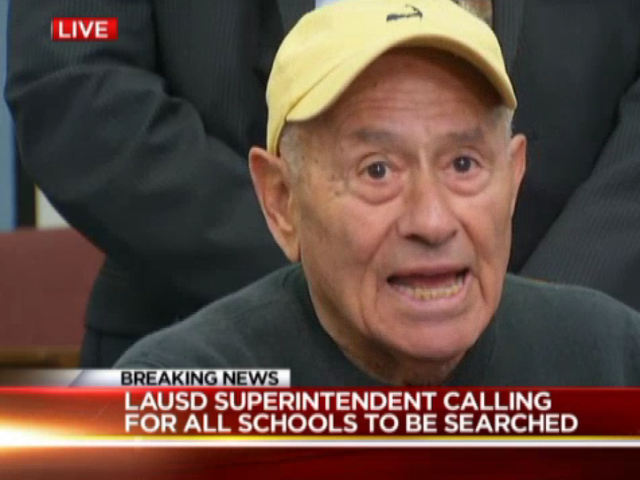 The San Bernardino attack influenced the decision to close the entire district, Cortines said. Vela said she worries about talking to her kids about the threat and terrorism in general. She's concerned about her daughter feeling safe in class. "I don't want this to be in the back of her head," she said. "Who knows what it does psychologically to kids? Is this going to cause her some kind of trauma so that she's not going to feel safe at school?" The closure came the same day classes were canceled at San Bernardino Valley College because of a bomb threat.